Oh my goodness....this is beautiful! So simple, elegant, and pretty...love it! Love the sparkly goodness on these gorgeous butterflies, Lucy! This is such an exciting time in your lives Lucy! 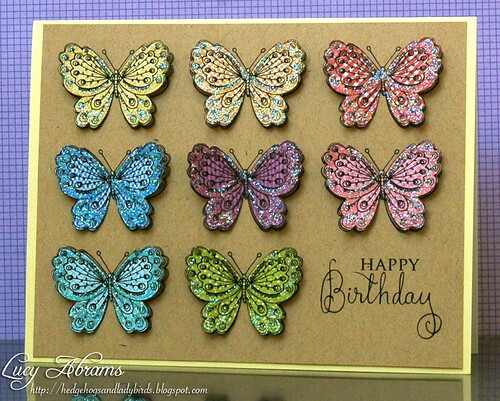 Love this sparkly butterfly card! Glad you are feeling better about child birth. I was terrified my first time right up to the moment I went into labor and then all the fear left. All I could think about the moment I realized I was having contractions was that I was going to see my beautiful child in a few short hours. Hang in there!!! Simply beautiful!!! I wish I could make my Stickles look that good. I usually get more globs...makes me wonder just how much more practice I need!!! What a lovely array of colors on your butterflies, so pretty!! When are you due? gorgeous! and as far as childbirth, I was sooo nervous b/c I don't have a high threshold for pain...but I did it and my first took just 7 hours and was perfect. The second one I did without meds b/c it went too fast, but still I did it and you can too!!! Billions of women have gone before you and you are just as able to do this as they! best wishes! !